When the temperatures drop, sometimes school spirit can drop as well. We’ve got eight great ideas to help your school combat those winter blues and keep school spirit up, and students energized, for as long as winter lasts. Get your PTA or PTO involved in planning a mega-size winter fundraiser that gets the whole student body excited! Fundraising items can be anything from functional (custom knitwear) to electronics raffles (chargers, speakers, headphones) to classic favorites (drinkware, apparel, sunglasses). Choose more than one fundraising item to maximize your profits. This is a great way to engage students in every grade and get them thinking about others even after the holidays have passed. Hold a food and clothing drive for a week and donate all the proceeds to a local shelter. Your students will feel proud of their efforts, and community members that really need food and clothing items will appreciate the results. There is no better way to keep students and staff warm during the winter than hot cocoa. Designate one day (or several days) as Hot Cocoa Day at your school. Hand out FREE hot chocolate, in custom mugs featuring your school’s mascot, before school or during lunch. Students and staff will really appreciate this tasty treat day. Students love a school dance, and winter is a great time to have one. A Snowball Dance is a fun way to give students some indoor fun that also keeps them safe and warm. Give your dance a winter wonderland theme, but provide lots of warm food choices, like hot chocolate or hot apple cider in custom mugs, bacon wrapped smokies, or mini meatballs. You can also create the illusion of warmth using decorating fabrics, like gossamer. Bring the festiveness of Spirit week to one week in the middle of winter! Have a pep fest, designate a different dress theme each day, have lunchroom contests, and more. 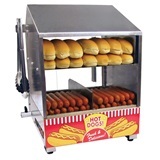 Don’t forget to break out the concessions machines (popcorn machines, hot dog warmers, and nacho warmers). Use the winter weather to your advantage and hold a Snow Sculpture Contest. Students of all ages will love this idea. It will give your school a way to come together to create amazing artistic pieces, and it increases school pride at the same time. Hand out awards for the Most Creative, Best Snowman, Biggest Snow Sculpture, Smallest Snow Sculpture, Most Colorful, and other categories. A Winter Carnival can be held both indoors or outdoors (or both!). Pick a Saturday and hold games, raffles (stadium blankets), contests, have lots of food and treats, and/or hand out awards. Indoor games can include a ring toss, balloon darts, mini golf, etc. Some outdoor game ideas include a snowball toss, breaking frozen balloons, and more. Don’t forget to sell custom (warm) apparel like socks, beanies, and gloves in a carnival booth. Students will love a chance to perform in a Talent Show, and everyone will get to enjoy their classmates’ talents. Encourage as many students as possible to show off their skills, like dancing, singing, music, magic, comedic acting, telling jokes, and more. You can even offer discount tickets to the show by bringing an item to donate to a local food shelf. Before the Holiday break, host an Anonymous Santa/ Toys for Tots drive, and offer a breakfast of donuts and juice to the class who donates the most. Host a Student Talent Show; it’s a great fundraiser for Student Council, a great opportunity for students to celebrate their peers’ dancing, singing, instrument playing, yo-yo-ing or Kendama-ing, skit creating, joke telling, or various other talents. Students could also get discount tickets by bringing an item to donate to the foodshelf.